The original Black Water tire was first introduced in 1989 by ITP. It was the industry's first tire designed for riding in the mud. 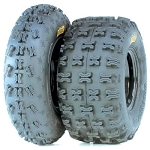 It was a huge success and quickly became one of the most sought after tires for most 4x4 ATV riders. In celebration of ITP's 30th year of doing business they have release the all new Blackwater Evolution tires. The black water evolution features a rigid 8 ply radial construction and it utilizes the most advanced features in tire technology. This tire is designed for the demands of the rapidly growing UTV (side by side) vehicles. It features a non-directional tread design that grips extremely well while driving forward and in reverse. ITP gave this tire an all new "tough tread" rubber compound which offers excellent tread life and durability. It also features an exclusive "Sidewall Armor" which protects the shoulder area from punctures. 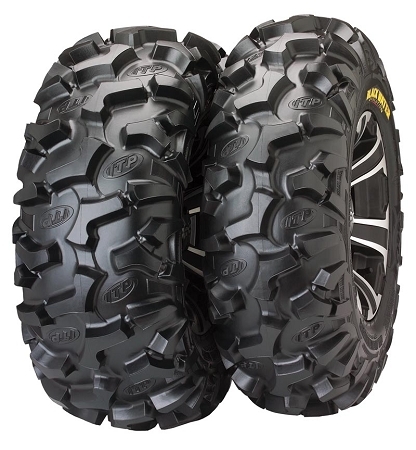 - ITP Blackwater Evolution ATV tires are sold individually. 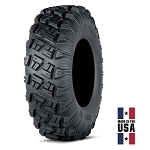 I was looking for a tire to put on my Kubota RTV X1100 that would stand up to the heavy 2500 pound weight and provide much more traction than the factory tires did. I had previously tried the BajaCross tire and though I was satisfied with the traction, I continuously had problems with the rubber developing small cracks at the corner between the tread and the sidewall and then would develop leaks. At first I thought it was just a faulty tire but then had another tire do the same way and fail with 75% tread remaining. I know those were also ITP tires so Im hoping that this particular tire doesn't develop the same characteristics later on. As for now Im completely satisfied with the traction, wearability, and toughness of this Blackwater tire. Have roughly 1,000 miles on them now. They are much more stable in the sidewall and dont sway with the weight like others. If you have a heavy UTV/RTV this would be my pick of all the tires I have tried. I got my tires very fast, A+! Ride nice, steers better, bite good on the trail, yet don't rip up the lawn like my Mega's do. Went thru all the same slop/trails/water my Mega's do w/o a hiccup. Very impressed w/Blackwater Evo's. Just got these new tires and they wired very well on sand and rock. Lots of tread and much stiffer sidewalls that the stock tires on my RZR900. Great tire for most all conditions but excel in lose conditions where traction has been a problem in the past. These tires really hook up. These tires are worth every penny, great traction and durability. Great all around tire. Not to mention pureoffroad.com for great service and super fast shipping! 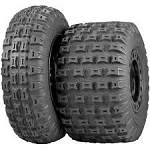 I purchased a set of 4 of these tires to replace OEM tires on a Kubota RTV500. These tires are an inch bigger (25") but the wheel size was the same, and they fit without any clearance issues. They seem taller than 1" more the OEMs, maybe because of the tread depth, but maybe because the OEMs were well worn. Walmart changed them for me for $8/ea. which included new valve stems. These tires lose a bit of traction on loose gravel, but they dig in almost everywhere else. I'd buy these again - I think they'll last much longer than the OEMs. I put these on my 2WD Mule and was going thru mud holes I never even would have attempted with my old stock tires and rims. These tires really eat mud! Pure Off Road and ITP do it again! Just put a full set of 27 inch ITP Blackwater tires and 14 inch SS112 rim on my wife's white Polaris 570. This machime looks GREAT! The upgrade to her machine makes my 850 look like a toy now. I'll be back soon to upgrade the tires and rims on my 850 as well. Great SERVICE! Got the items sooner than I expected and they did all the work. Great job Pure Offroad! I wish I could post a picture! Very nice tire 26/9/12 make my 570 look mean !!! Very good traction!! These are a good upgrade from the stock tires on 2014 maverick have more traction and a smother ride. I have only had these for a little while and they rip around my property. I can't wait to take them on the rocky trails to 11,000 ft. It is very promising, but the trails will not open until the moose move up with the calves - I can wait for that! I only rated them at 4 stars, but I bet they deserve 5 after I climb to tree line. The tires look great! Handle good and shed mud too. Fast delivery and thanks for working with me on returning the first set I changed my mind on after seeing. Just bought a set of these and just like all orders from Pure Offroad they arrived super fast and ready to go. They look awesome on my RZR and ride real nice. So far I love them. Guys this is an awesome tire, great tread design and a very smooth ride to go with it, haven't had the opportunity to challenge any mud yet but feel very confident that they will handle it with ease. Pure Offroad was spot on with pricing and prompt delivery. Q: I had ITP Baja Cross XD 26x9x12's on the front of my Polaris Ranger. They ran a little bigger than the size thats stated and Im wondering if the Blackwater Evolution tires will run bigger or smaller? A: The Blackwater Evolutions are running a little smaller than advertised. A 26x9-12 mounted on a 12x7 should measure around 25.5 inches tall. The width of the rim, the air pressure, the weight of the vehicle & the tread life on the tire can all affect the height of a tire.